This is such a great idea! Vicki Waldorf, wife of PGA Tour pro Duffy Waldorf, started this company when she realized there were no baseball caps designed for women. The name comes from a nickname she gave her daughter who, when she was a baby, used to chase after her older brothers, always wanting to go with them, saying "Gogie, Gogie, Gogie." Thus, her company is designed for women who are on the go. Let me give you some highlights of how this hat is specifically designed for ladies. For one, it's very lightweight, made with a soft mesh fabric. It's designed with lots of room in the back, making it easy to wear a ponytail. The black underside helps kill the glare from the sun, and the Silton lining helps prevent makeup stains. My favorite thing about the hat is the logo on the front of the hat. It actually reminds me of the lady's version of the Ashworth logo. It's very simple, but cool looking. 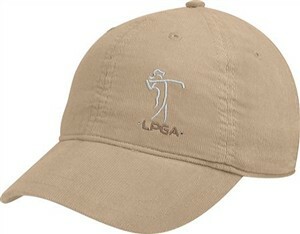 This particular style is a plain hat with just the logo. It is a standard fit and will fit heads with a circumference of 21 inches to 24.5 inches and comes in pink and beige. I'd go with the pink, as the more feminine colors seem to be all the rage on the LPGA tour. I would also recommend that you check out the Dottie hat. This is a wild polka-dotted hat that is sure to draw attention.